It would make an incredible horror movie. THE PLOT: stunningly convince hundreds of millions of individuals worldwide that what isn’t a good thing, really is. That what appears to be so, isn’t. Or that leaves only look green because of alien filters in your eyes. That ripe apples fall because invisible evil hands pull them down. That fire doesn’t burn your skin–it’s only your imagination, so ignore the fake pain and blisters. That giving you only one of five thyroid hormones…a storage hormone called T4 with the name of Synthroid, Levothyroxine, Eltroxin, Oroxine, etc…is all you need to adequately treat your hypothyroid state. Because if those in authority say so, it must be so…right? If you have never heard of the term “gaslighting”, it describes a form of manipulation by an individual or enterprise. The result is to cause you to doubt your own intuition, intelligence, perceptions and natural wisdom. implies a person in authority knows what he or she is talking about or doing, over your own inner wisdom and observations. makes you question your own self. makes you second guess what is going on and your own perceptions. spins a false interpretation of reality. tries to put the blame on you. is a way to benefit the person or enterprise pushing the delusion for their own aims. 20 ways that Hypothyroid or Hashimoto’s patients are gaslighted–which ones are you? Stating that iodine is the worst thing for every and all Hashimoto’s patients (in spite of those with Hashi’s who discovered that iodine lowered their antibodies if they used it correctly with supporting nutrients. It’s individual and each Hashi’s patient has to find out for themselves). 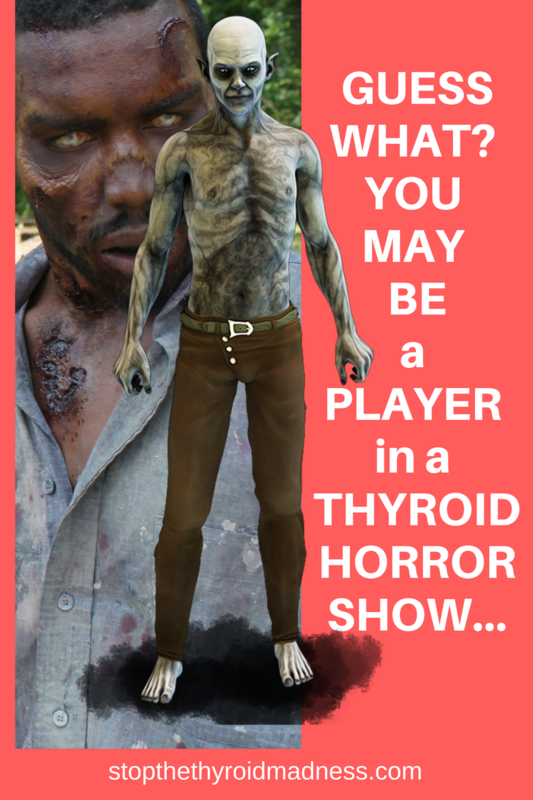 So you see, the horror movie plot has been a reality for hypothyroid patients. Like a few years ago. A couple saw the STTM book in my vehicle and struck up a conversation with me. She was on Synthroid; he was on Levoxyl–a former T4-only med. They had each been on their T4-only treatment for 12 and 14 years respectively. They felt their hypo was perfectly treated and they believe in their doctors. So the other problems they dealt with were separate: his rising cholesterol, her depression, his fatigue, and her weight gain. But of course, they felt those have nothing to do with their T4-only treated hypothyroid, as some of it was their own fault, and their doctors are right…leaves aren’t really green, invisible hands make ripe apples fall, and fire doesn’t really burn. Gaslighting. Check out the best list of hypothyroid symptoms on the net, totally based on reported patient experiences, reliable, and not culled from other cold lists to bulk it up. They can even occur on Synthroid or Levothyroxine, report patients over the years. Have you Liked the STTM Facebook page? One of the most helpful thyroid Facebook page on the internet and based on reported patient experiences and the wisdom gained. P.S. The photo is an actor portraying a zombie. It’s simply to represent a horror show. My Endo told me he�s tired too and he�s high strung so he has anxiety too. Being tired from moving to the couch from the bed is not the same thing as being tired after a productive day. Jerk! I fired him! Anyone used strategene to interpret their 23andme results? I’ll stick to Methyl then. Thanks for the answer. Can you point me in the direction of a good test for heavy metals besides the direct labs one? I’m in Canada and can’t order from them. Don’t have anybody in the states, I’ll have to look for something else. Thanks for the response. If you would like that test – I live on the border (Michigan) and then pick it up for you and mail it to you in Canada. Don’t mind helping out! So livewello suggets I take hydroxy and adenosyl forms of b12. But I’ve been on super high doses of methylcobalamin for over a year and haven’t noticed any side effects. My histamine levels have not resolved though, is this a sign I need to switch? How are you supposed to feel if you’re not tolerating it? I don’t want to switch to more expensive less stable forms of b12 if I don’t have to. Experts have found it’s not as good an idea to do hydroxy as it is methyl B12, the latter working with numerous bodily processes. In fact, Ben Lynch states that “methylfolate and methylcobalamin are in tandem to support methylation”. It’s stated that hydroxy is about 1% as effective as methyl, too. And hydroxy “competes for methyl groups instead of providing them and needs energy (ATP) to complete these up hill energy transactions.” Adenosyl is also excellent. But…with all the latter being said, not sure about histamine levels. Hope you get an answer. Progesterone may help adrenals make cortisol and help the thyroid medicine last longer. This maybe better than taking cortisol. Pituitary maybe hurt by gluten also so TSH maybe very low and ACTH for the adrenals. TSH should not be used for thyroid. Get free T4 and free T3 in the upper range. Mitochondria maybe hurt and a person may need a higher thyroid dose. Detoxing heavy metals may help unblock the thyroid and other chemical reactions. Zyto scan shows infections and how glands/organs are working. It is very interesting. Iodine may help make thyroid hormone. Se with iodine may help. Zn/SE/enough iron/probiotic may help convert T4 to T3. Taking iodine 2% drops at night help me sleep very deep. I had 30 years of no sleep due to getting Synthroid which did not convert to T3 due to not having minerals due to gluten. Gluten may hurt the thyroid/pituitary/other glands/gut lining so less minerals and nutrients absorb and hurt the liver so it doesn’t detox well. Raising oxygen in my brain helps me sleep. No gluten helps rebuild cells to burn oxygen. Amour thyroid helps get the mitochondria to burn oxygen/food and make ATP energy. A thyroid test doesn’t show heavy metals/mitochondria issues/gluten or soy/cruciferous family issues and more. A thyroid test only should not be used to determine thyroid problems. Giving the right amount of Synthroid and Amour may help. Synthroid may help a person get through the nigh with one dose in the morning…may act like time release being T4 only which converts to T3 when needed. Some thyroid medicines may have gluten in them. Taking thyroid medicine…I don’t eat 2 hours before or 2 hours after taking it. Ca etc. may block thyroid medicine. Thyroid medicine can be put under the tongue to help it get into the blood faster and help fast and more may absorb. Hospitals ;may only do a TSH and not care about any other factors and may withhold thyroid medicine which helps the immune system and much more. Prevention is easier than cure. Avoiding gluten/hidden gluten may help stop antibodies to the thyroid. LDN may help block hidden gluten. Gluten is wheat/barley/rye..oats/corn/rice. Some people are grain free…eat Paleo diet. Lyme/coinfections may steal Mg/Mo/Mn/Fe which is needed. Lyme may interfere with mitochondria. Alternative doctors may help with thyroid dose and go by symptoms so a person can feel well and not just by numbers. They consider the other factors affecting the thyroid hormone. Withholding thyroid medicine keeps a person sick and going to the doctor which makes them much money. They may get statin drugs/antidepression medicine/blood thinners/air conditioners and cooling suits instead of thyroid medicine. I get blood clots when my thyroid medicine is too low. Serrapeptase helps eat up clots..taken at night ..may take 3 times to help. Fish oil thins blood. I have Factor V Leiden clotting disorder, but it only kicks in when my thyroid medicine is too low. Iodine 2% drops at night seem to make up for not cutting my thyroid medicine good enough since it crumbles and it has a plastic coating on it. Sweating may detox bioidentical hormones/thyroid medicine and supplements. Sweating may help lower heavy metals fast and good minerals. Sea salt may help restore 20 minerals. Shasha, though some do see progesterone convert to cortisol, others do not. The conversion cascade doesn’t work the same between individuals. So no, progesterone may not be enough for those with low cortisol. Second, no, free T4 should not be in the “upper range”. By doing that, too many patients have seen the body try to clear it out by making rising RT3, the inactive hormone. The latter makes them more hypo. Detoxing high heavy metals can definitely help, but during the detox, it tends to cause excess RT3 as well, many have reported. So people often need to be on T3-only. Also, Synthroid is a problem even for those without high heavy metals. There are simply too many issues which can negatively effect conversion, sooner or later. So I got gene testing done through 23andme and had it interpreted by livewello. If I’m understanding things correctly every gene listed in the livewello report is a deviation from the norm to different degrees depending on the color presented (since green doesn’t mean normal). Well there is well over a hundred genes on my report… including numerous MTHFR’s. Am I seriously this defective? Ok I jumped the gun on that. Apparently genes even presented as red don’t necessarily point to abnormalities… and the results say we have to see a gene specialist to gain any real closure. In Canada I can’t get referred to a gene specialist easily. My Doc already told me no based on other lab results. Just a warning to those looking into 23andme… don’t bother unless you have access to a gene specialist. Actually, the info you get on LiveWello is fantastic. The green means no inherited variants. The yellow means you inherited a variant from one parent, i.e. heterozygous. The red means variant from both parents, thus highest risk of displaying issues related to this mutation, i.e. homozygous. Which lyme test are we supposed to take? There are so many options just for the basic Borrelia test. And can you get Babesia and Ehrlichia without having Borrelia? Igenex seems to be the most recommended testing for Lyme itself. Not sure about the other tests they offer. It’s easier to tell patients they’re crazy than for doctors to do their jobs. Thank you for this post and all the hard work you do. I honestly can’t fathom why doctors refuse to believe their patients. Laziness? Kickbacks? Ego trip? It’s bizarre. According to my lab results from Canada: Iron 22 (“Normal”), TIBC 43 (“Low”), Saturation 51 (High), Ferritin 134 (High). So my Doc says I should not have MTHFR gene or hemochromatosis due to those results. I know you list different optimal lab results for Canada but my Doc insists they are probably outdated as they keep changing them here. Even my high Ferritin he claims is not high enough, 500 is apparently cause for concern. Could your lab results be outdated by any chance? I don’t wanna pay hundreds of dollars for gene testing if I don’t have to since my Doc says they will refuse me the test as I look to be in normal ranges. Sue, a lot of the information on that article is BAD. It’s not about the TSH, first and foremost. Many patients have a TSH of 1 or 2 with raging hypothyroid symptoms. http://stopthethyroidmadness.com/tsh-why-its-useless And it’s definitely NOT about levothyroxine. http://stopthethyroidmadness.com/t4-only-meds-dont-work If you wanna get well, you need to entertain better that patients are FAR ahead of what you are reading and trying to follow…. I know what you mean regarding doctors but what I am saying is surely he has been around long enough to see and know that those results are way out. So the question in this case is why is he dismissing them as normal. A one line letter reply, “I am happy to say the Thyroid function tests are normal”. You really can’t win. Once again many thanks. Sue, some of most seasoned doctors STILL don’t get it. Brainwashing of poor information stays long and hard….. Many thanks for your reply .I can’t make it out at all. The E.N.T surgeon who carried out the op, reputable as far as I know, shared patients thyroid cases twice a month with other team experts in the field, endocrinologists, etc , where they decided what they were going to do with each referred case. As far as I was concerned he seemed a decent doctor, someone mature who should not seem clueless at all, well practiced apparently in one of his fields, (The Thyroid). ? I wonder if it is down to cost, the G.P said “come back the middle of July” “I can’t see them dong any blood tests before that”. It is getting steadily worse, bones feel weak, getting out of breath climbing the stairs etc, I have been like it for many years as I said, it is not good to be left in this state even longer. The only other scenario which I dont know much about is this,( Euthyroid sick syndrome (also known as nonthyroidal illness syndrome) can be described as abnormal findings on thyroid function tests that occur in the setting of a nonthyroidal illness (NTI), without preexisting hypothalamic-pituitary and thyroid gland dysfunction. Could it be and would or should this exclude a patient from being treated with thyroid medication if the bloods TSH and T4 were out.? If I’m understanding what you are stating, do know that “reputable”, or “decent” or “mature” or even doctors with great personalities can be very, very wrong about thyroid diagnosis and treatment. This is exactly why patients started getting together and figuring things out on their own, which is what STTM is about. Sue, the consultant is in the dark ages and keeping you sick. This is exactly why Stop the Thyroid Madness exists. People without thyroid problems usually have a TSH in the upper 1’s…and conversely, there are also people who have a TSH in the 1’s and 2’s who have raging hypothyroid symptoms. Even though the TSH is the WORST thing to go by, 5.23 is seriously hypothyroid. It’s the FREE T3 and FREE T4 that count, and it’s where the result falls in the ranges that also counts. http://stopthethyroidmadness.com/lab-values So do your clear symptoms. AND READ THE STTM WEBSITE. The revised STTM book is a must as well. You need to become more informed. It’s the only way to get well in light of CLUELESS consultants. Go to an Alternative doctor for thyroid help. TSH above 2 may make a person sick. Gluten may cause antibodies to the thyroid and maybe the number one cause of thyroid issues. See my other comment. Zn/Se/enough iron/probiotic may help convert T4 to T3 and not eating gluten may help. Best wishes. I have had a Hpothyroidism Hashimoto surgery .Put me on Levothyroxine 50 MCG TAB. I HAVE THE FATIQUE EVEN AFTER A GOOD NITES SLEEP.FEEL FOGGY,WHEN I WAKE UP.GAINED WEIGHT,BLOOTED STOMACH,LEGS ACHE VERY BAD .CAN’T WAIT TO SIT DOWN,SHORTNESS OF BREATH. HAD A AORTA HEART VELVE PROCEDGER DONE.ABOUT SIX MONTHS AGO. HOPEBYOU CAN HELP ME.REALLY HAVING A STRUGGLE WITH BEING HOT AND COLD. THANK YOU FOR YOUR HELP ! Go to an Alternative doctor for thyroid help. See my other comments. Best wishes. Hi, I’m 26 and was diagnosed with hypothyroidism in March 2014. My aunt has Hashimoto’s and when I told my UK doctor that, no further testing was done and she simply said ‘well you probably have that too.’ Not knowing ANYTHING at all about Hypothyroidism, Hashimoto’s or anything else thyroid related, I asked if further testing can be done to give a firm diagnosis and was told it wasn’t necessary. Naively, I didn’t push and just upped my dosage until I was in a ‘normal’ range. Not surprisingly, 3 years later and I’m on 125mcg of Levothyroxine only with a TSH level of 2.7 and still feeling awful. Sometimes better, sometimes worse – on a good day, I’m still struggling to lose the extra kilo’s but feeling energetic and motivated, happy and like myself…on a bad day I’m foggy, EXHAUSTED and struggle to get myself going and even then I can’t make it through the day without a lie down. I also get regular migraines and from time to time also; irregular heart beat/racing, shivering and anxiety. I have two children so I have to get out of bed and get through the day but I feel physically and mentally drained on a bad day and I hate it! Even though I’m present and doing stuff with the kids I don’t feel fully there. This all sounds like depression but I started feeling like this at the same time I had my Hypo diagnosis and it definitely hasn’t got any better yet. I have recently moved to Germany (sept 2016) and my new doctor here is great so far…thankfully he doesn’t just go by what the tests and the numbers are showing him but I’m really just wondering if anyone has any advice for me; what do I need to ask for to make sure I’m covering everything and getting the right info? I need a definite answer to what kind of Thyroid problem I am dealing with – up until now I accepted the ‘Hypothyroidism or Hashimoto’s triggered by childbirth and stress’ answer but I need to feel like (and look like) myself again; I have two children that need me to be healthy and I’m about to start applying to do my Teaching degree over here. It’s such a relief to see that I’m not alone with how I’m feeling so any help or experience is so welcomed, although I’ve been on T4 (Levo) for 3 years now, I’m still such a newbie! Thank you. Hi Amanda. One of your biggest problems is being on Levo. It’s just been a lousy treatment for millions over the years, and depression is one of many results of being on a poor treatment. http://stopthethyroidmadness.com/t4-only-meds-dont-work The same page will mention what does. And second, people with Hashi’s need to keep track of their antibodies to see if they need extra help to get them down. http://stopthethyroidmadness.com/hashimotos I would also strongly recommend getting the revised STTM book, so you can start your journey to being better informed, because we HAVE to be in light of doctors who don’t get it. Book Depository online in the UK has it. Zn/Se/enough iron/probiotic are needed to convert T4 to T3. Gluten may not let minerals absorb in intestines and may make antibodies to the thyroid. Mg may help headaches and much more. Go to an Alternative medicine doctor. See my other comments. This is what helps me …short version. No gluten/dairy/soy/sugar/GMO/food with a label etc. and vitamins/good oils/minerals/probiotic…. LDN and detoxing help me. Vit D3 5000IU, zinc 50mg if detoxing, 2000mg fish oil, 2000mg evening primrose oil. 2000 mg lecithin, Phosphatidylserine/DMAE, krill oil, CLA, Coenzyme Q10, Rhodiola, Mg citrate 400mg, Vit C, 5000mcg of biotin, 10,000IU of Vit A, Nature’s Plus- Source of life multiple, HCl and Now brand- Super enzymes with meals, dairy free strong probiotic, Vit B12 methylcobalamin shot/spray/under the tongue kind/intrinsic factor kind…. MTHF folate, coenyzme Q10, rhodiola, may help brain/body/thyroid/depression/immune system and more. Gluten is wheat/barley/rye/corn…oats has gluten with avenin…and there is a small amount of gluten in rice. GMO corn/soy/canola oil may hurt. Amour thyroid maybe needed since gluten may make antibodies to the thyroid. Coenzymated B vitamins far from synthetic kind made me calm. Sunlight (helps the immune system and helps to heal the gut lining),exercise, organic food, good water..not tap water, cooking by scratch pure food….. no food in a box/bag/premade/label/restaurant which may help avoid hidden gluten. Certified gluten free food may have 20ppm of gluten…too much. Nuts not sold in the shell/meat basting/some spices/food with a label/ lotion/make up etc. may have hidden gluten. One restaurant cooks special for me…rice/veg/tea/extra mushrooms (no meat since the woks may have MSG/gluten in them). Amour thyroid has some T3 and Calcitonin. Synthroid is only T4…may not convert to T3. Zn/Se/enough iron/strong probiotic may help convert T4 to T3 for thyroid. Books: No grain No Pain, Wheat Belly, Grain Brain, Dangerous Grains and The Autoimmune Fix and more explain Celiac. Peter Osborne/Tom O’Bryan on Facebook/Youtube. Best wishes. So I switched from Synthroid to NDT (Thiroyd) and got really ill. I know readers here insist it’s because my adrenals are taxed and other things might be off balance but the leading Hashi specialist in Canada here insists you guys feel better on NDT because you didn’t raise your T4 only meds high enough because the Dr. would have dosed based on inaccurate lab results. Has anyone here done T4 only and dosed according to symptoms alone before switching to NDT? My specialist says that NDT has a T4 and T3 ratio of about 5 to 1 while a human’s thyroid would produce those hormones closer to 10 to 1. So her reasoning is I got sick on NDT because I am not able to raise it high enough to get sufficient levels of T4 before I am overwhelmed with too much T3. Anyone have thoughts on this? My specialist also suggest I change to Westhroid if I insist on getting all the hormones because the ratio will be correct and not from porcine, yet the site says T4 and T3 is in fact from porcine so wondering if the formula has changed since… starting to feel pretty screwed. The answer is…that is one lousy and clueless doctor. Canada is low sunlight which causes Celiac which can cause low thyroid as it makes antibodies to it. No gluten may help and more. Specialists are not better than Alternative doctors. Taking Synthroid/Amour combo may help. Yes…want enough T4 to get a person through the night. See my other comments. Shasha, it’s not about “low sunlight”. Most medical professionals actually aren’t totally sure of the cause, but they do seem to agree that it’s triggered by certain gene mutations that make some more vulnerable to acquiring it in the face of certain stressors. One issue which makes people more vulnerable to Celiac are those who tend to have autoimmune issues. What is surmised also is that vitamin D deficiency can make one’s Celiac worse, but it not necessarily the cause. I found http://www.compoundinglab.com.au (Brisbane) and http://www.acpharm.com.au (Sydney) will do it but only if you get a prescription, price is around $75-90 for 100 capsules, (made from imported Porcine) , I’ve been told that a daily dose of 200mg of Eutroxsig/Oroxine is equivalent to about 120mg of NDT (2 grains). I hope this info helps all Ozzie sufferer’s. I’m a 55 yo white male living in Australia. I have Hashimotos. Currently around 140kgs, yes I have the all too common sudden weight gain issue with inability to lose it once gained. I’m on 200mg per day of Eutroxsig, anything less and I get a funny precursor in the form of Benign Positional Vertigo (BPV) which lasts about 3-5 weeks before it subsides. To get back to normal I usually take more for a week or so. My quack is concerned about the very low TSH levels, last few years its been hovering around that. My quack keeps advising me to take a lower dose to get my T4 down but I know if I do I’ll get BPV again, so Its a bit of a catch 22 situation. I cant find a thyroid specialist who will recommend NDT let alone be that versed in the subject. I have asked my doctor about it and he just echoes the guidelines that all doctors go by. Looking around I cant see a supplier of NDT here in Australia, maybe someone from here can advise. All we can tell you is that your free T4 is too high. It’s probably converting to RT3 to clear it out, and rising RT3 makes one hypo. There is compounded NDT in Australia, so you’d need to find a doc for that. See an Alternative doctor. PItuitary may not be making TSH and mitochondria maybe hurt. I get blood clots when my thyroid medicine is too low. Serrapeptase taken at night helps eat up the clots..may take 3 X to clear a clot. See my other comments. I’m on 50mcg levothyroxine. Symptoms are persisting and my GP is not interested so planning on self medicating with NDT. Does the dose recommend in your Thyroid 101 post (start on 1 grain, raise by 1/2 every fortnight aiming fo 2-3 grain mark) apply to everyone or do people like me who are on a low dose of thyroxine need to start lower? Based on 15 years of reported experiences, it seems to apply to everyone. It’s the final optimal dose which is different from person-to-person. Some are optimal somewhere in the 2 grain area. Some are optimal in the 3-5 grain area (I’m in that area). A very small minority are higher. My doctor just increased my NDT from 2.5 to 3 grains a day but he said I should take it all in the morning. Is there a better or more common way to split 3 grains? That’s what I was doing before when I was on 2.5 grains (1.5 in the am and 1 in afternoon) but these pills are 1.5 grains each so I think the best I could split them up would be either 1.5 (am) and 1.5 (afternoon) or 2.25 grains in the am and 0.75 in the afternoon. My doctor isn’t very knowledgeable with NDT or writing prescriptions for it but he’s wiling to try anything to help. Should I try to get the prescription for 3 – 1 grain pills a day so I can take 2 grains (am) and 1 grain (afternoon). Any insight you have would be great! And thanks for keeping such an amazing site on thyroid! My optimal dose is 3 1/2 grains, so I take two in the morning and 1 1/2 in the early afternoon. So I get the two grain and one grain pills, but all one grain works, too. I already have a 3 months supply for 1.5 grains twice a day so hopefully I’ll be able to switch after that. Does your doctor have to write anything or word it special for that or does the pharmacy just fill yours like that? Thanks so very much. Doctor writes it the way I want it. My doctor says my numbers are fine but I still do not feel or look that way! Compare your results to the following page and see if they fit where patients find themselves when optimal and feeling great: http://stopthethyroidmadness.com/lab-values It’s not about just falling in the normal range…. My numbers seem fine compared to that page. But I haven’t done a saliva test,iron, or the thyroid antibodies. My temp last night was 96.2. When I took it this am it was 98.0. When I did an allergy test, my Candida albicans came back high. So I have been taking Candida blasters and watching my sugar intake. I used to see an endocrinologist back last summer but he put me in synthroid, water pills, metformin and adipex. None of these things helped. So I got off all of them and found a more holistic doc. He doesn’t specialize in thyroid but got me on WP thyroid and feel much better. I would love some helpful insight, I feel very alone and frustrated/ slightly depressed. Do you have any advice for me going forward? So your free T3 is at the top of the range, and your free T4 is definitely around midrange, and TSH is quite suppressed?? I will be seeing a new endocrinologist in the next weeks. Should I be asking for anything specific? Thank you for your response! Hi Janie, Thank you for the response. I had my TSH retested in the morning (first time was late afternoon) and this time it was 4.23. Both Hashimotos antibodies were 1. I assume that means I can rule Hashi’s out now and the higher TSH is perhaps more accurate because of the morning blood draw? What’s the best way to find a Houston doctor who will take me seriously? I’ve been complaining of these same symptoms for more than 15 years and have been told there is nothing wrong with my thyroid. Hello all, I’m very new to all of this and I’m trying to learn about how to interpret lab results…so much confusing information out there, but I’m hoping someone might be able to help me decipher the numbers a bit. I have practically every symptom of Hypothyroid there is: extreme fatigue (take naps virtually every day and NEVER wake up refreshed), 40+ lbs of weight gain, severe abdominal bloating with certain foods (bread and pasta for sure), brain fog, hair is breaking and thinning and has very poor texture, eyebrows are thinning on the sides, hard to swallow sometimes, irritable bowel, returning carpal tunnel like symptoms even though I had surgery to correct that years ago, puffy face, swollen eyelids, depression, mood swings, memory problems, and I wake up a couple of times a week feeling like I’ve swallowed something and am choking in my sleep. The debilitating fatigue is probably the one thing that bothers me the worst. I wake up tired and I’m tired throughout the day. I had blood work the other day and here are my results. I didn’t have the antibodies test, but will do that in the morning in addition to retesting the TSH as I have read on various websites, that the time of day can in fact make a difference in the results. I figured since I was going back for the antibodies test anyway, that I’d just double check it. I don’t have insurance and don’t have a doctor yet. My thought was to order the tests first (so much cheaper doing it on my own rather than having a doctor order them) see if anything was glaringly obvious…and then go about trying to find a doctor. Anyone have any thoughts about the information I’ve given? I really appreciate the consideration and am learning so much on this site, so thank you. Oh…and another side note, I’m adopted and don’t have much information, but I saw a notation in my file that said my maternal grandfather had a goiter operation. Not sure if that is relevant, but thought I’d mention it. I am seeing a naturopathic physician to treat my symptoms. TSH 1.24 (0.04-4.50) free T4 1.1 (0.8-1.8) Free T3 2.5 (2.3-4.2) Thyroid Peroxidase antibodies 7 (<9 IU/ml). My tsh varies and was 3.97 a few months back. My Dr is treating me with nature-throid 16.25 mg qd for 2 weeks now. Am I on the right track? My ultimate goal is to be healthy and lose weight. Despite exercise and a wheat free grain free diet I have been unable to lose weight. Levothyroxine is a T4 medication, is that correct? If so, should it be lowered or should I suggest I go on a completely different medication? Sorry for my ignorance! Based on what we’ve learned in each other for 15 years now, your free T4 is way too high. We start making higher levels of RT3 when our FT4 is over 1.4. And that can explain your miserably low free T3 i.e. when RT3 goes up, T3 eventually goes down. And the latter makes you more and more hypothyroid. Are you on too much T4?? If you are, the body tries to clear it out by having it convert to more and more RT3 instead of T3. I am new and am concerned about my recent testing. I did a round of HCG in January to lose some weight for the first time so this could be the reason. My primary care doc who is treating my thyroid has me on .15 of levothyroxine and so did my endrocronogist years ago when I went to him. I am wondering if I should explore other options and maybe find another doctor. Please help! Exercise can burn out adrenals. Progesterone helps thyroid and adrenals. Too much stress/exercise may steal progesterone. Gluten may hurt the thyroid and pituitary that makes TSH. See my other comments. Best wishes. Shasha, it’s not that “exercise can burn out adrenals’ It’s more that “excess” exercise can push cortisol too high…and over time, the body will fight back and push the high cortisol too low. What gluten does to those sensitive to it, or those with Celiac, is primarily causes excess inflammation…and the latter causes T4 to convert to more and more RT3, the inactive hormone, making a person more hypo. Second, gluten to those sensitive to it, or those with Celiac, harms the body’s ability to absorb nutrients, and those lack of nutrients negatively effect thyroid hormone production. Not everyone has problems with gluten, though. Has anyone on here switched from NDT to Iodine and supporting supplements? I have been on NDT for over 15 years. I am on 2 grains (130mg) once per day. It’s rare that anyone can just drop NDT for iodine and supplements alone without hypo coming back, we’ve noticed. I was recently diagnosed with hypothyroidism and put on desiccated thyroid. My TSH is suppressed (I’m on a 2 grains/day) and I was wondering if your TSH is suppressed is your thyroid gland active at all? Can it still convert T4 to T3? I just switched to np and this us my first week and until yesterday everything seemed good. Today m y heart races like crazy…well it just seem like it. I’m on 1 grain 30mcg. Should I up it? My thyroid was completely irradiated 30 years ago. October 2016 I switched armour. Does the information about labs and ranges still apply to me? I get a racing heart at night. It doesn’t last long less than half hour sometimes up to an hour but it happens 8+ hours after my last NDT dose. I’m on 2 grains per day. Is it possible to get a racing heart from still being hypo?. My last free t3 was 67.74% of the range. I was thinking the same. I think if it were a problem with say too much NDT then I would experience it shortly after taking medication. My family is relocating to Canada soon and I think I’ll have to switch to ERFA, do you know if people are still have lots of problems with it? Hello, I have Hashimoto’s and I’m 22 years old. When I was first diagnosed with the condition I was put on levo, but quickly found a doctor that would prescribe me NDT. He started me on 1 grain. I’m up to 2.5 grains, and am still having no luck losing weight with a HR consistently in the high 50’s. My temperature sometimes drops under 97.4 in the morning, but I don’t trust my thermometer’s accuracy too much to be honest. My rT3 has been high before, and my T3 seems to hang out just below the range. My ferritin was also low in my last labs. Would I benefit from attempting to dose 1.25 grains in the morning and 5 mcg of T3 two times after that? Thanks for the help! Hi Dianne! Congrats to the world of NDT. A few things to share with you. First, NDT is not a weight loss drug. It’s more about giving you back the thyroid hormones you may not be getting, which in turn will improve your metabolism. Mary again here; regarding my post. Aren’t there times where you have seen some of us “may have” to switch back the other direction?? From Armour to Levothyroxine? Or should I just decrease my Armour thyroid 90 to 60 mg? Hi! I have been on Armour Thyroid for about 30 years, (currently at 90 mg last 5 years) with one small stint of Levithyroid years ago. I have Hashimotos. Over the last 2 months I am very anxious and feel heart pounding. I am talk, thin active 58 year old. My blood test in December showed (for the first time ever) a High level of T3 at 6.7 (range for LabCorp is 2.0. – 4.4). TSH and T4 were normal. I want to consider taking my doctors advice and switch to T4 only. It really just dawned on me today that the anxiety/heart pounding are not normal. Your thoughts? Are there times when I do need to trust the lab work/AnD symptoms and switch? Sadly, Mary, this is what happens to people who stay underdosed for so long…as you have probably done. i.e. your adrenals may now be stressed, thus the high free T3, which is called pooling. See http://stopthethyroidmadness.com/pooling And the heart poundin and anxiety are due to excess adrenaline i.e. your body is alarmed now. And we are forced, in a situation like yours, to go down a bit to stop the reactions. hi. Did you mean I might need to go lower than 90 mg on my Armour thyroid until I get a new blood test and saliva testing done? Is saliva testing still about $150 most places? I did it years ago and was flatlined all day. But I do need to find out where I am at now since I take Hormone Replacement Therapy for the last year and a half and I love the help it has given me as far as mood and skin quality. Hi. We stay at, or we lower to, the amount that doesn’t cause us problems. It will mean we are still hypo, but at least it’s an amount that doesn’t cause further stress and excess adrenaline. Saliva testing can be a little lower than $150 at many places. Also, in your experience have you heard any patients actually doing well on desiccated plus a little bit of T4 like Synthroid? Not needed. NDT is 80% anyway. I’m not able to lose weight and my body and face will retain fluid on and off quite suddenly. It’s very unpredictable and I have really bad fatigue I’m on 2.5 grains (acella) and these were my recent labs so I was hoping you could provide me something advice. I don’t know whether to increase or decrease my NDT, add cytomel or even synthroid. Thanks for the insight. I read the link and agree a raise might be the avenue to take. Jamie, I am on Amour 60 in the morning and 30 in the afternoon and I have Hashimoto and it is extremely debilitating. I am getting cold after I eat and it does NOT matter if it is ice cream or piping hot soup and I have to put on warm clothes because I am just shivering like crazy. Now in the afternoons regardless of whether of not I have eaten, I have the shivers where I will shiver for a 5-10 seconds then have a maybe 5-10 minute pause and repeat. This usually starts about 430-5 in the afternoon. I am going to a doctor at a UNIVERSITY run medical clinic now: Wake Forest Baptist Medical. I am also on meds for adrenal insuffency 10 am and 5 pm. Hi Andrea. It’s very unlikely that 90 mg is an optimal dose, based on what we see in each other for years. And if we have low cortisol, it’s not about doing adrenal meds twice a day like that. Chapter 6 in the revised STTM book is how we learned to do it successfully, which also applies to Adrenal Cortex. Great blog post and reminder to be true to self and symptoms. Thank you Janie. I am so grateful I did the research and found “Stop the Thyroid Madness” and convinced my doctor to take me off Levothyroxine and put me back on NDT. On Levo, I had terribly painful leg cramps at night, low energy, foggy thinking, and I had restless legs every night. On NDT, I have no more leg cramps or restless legs. I am located in Austria and was diagnosed 3 years ago with Hashimoto’s and put on Thyrex (Levothyroxine) right away. It helped at first, but I had to increase from 25 microgramm daily to now 125 mcg daily. I read a lot on NDT but I can’t get it here in Austria. No one here believes me that you can be “in remission” with Hashimoto’s or any other auto-immune disease really like the countless people I “met” online. Doctors here in Austria keep telling me I can’t get off Thyrex and always will be on it but I refuse to believe that. Still before taking it, I had intense pain, hair loss and all the stuff. I don’t want to quit it without a better plan! Can anyone help here?! Martina, success with getting off thyroid meds when one has Hashi’s has to do with whether you caught the autoimmune attack on the thyroid quick enough i.e. the thyroid wasn’t terribly destroyed by the attack because it was caught towards the beginning. Those people can get off thyroid meds if they stop the attack, and they do so with medications like Low Dose Naltrexone and getting off gluten, etc. But if the attack was going on awhile, and still is, there is a possibility of never being able to get off. By the way, patients in countries where NDT is almost too hard to get at least at T3 to their T4. Or they have NDT sent in to them. T3 may help- if you can get it. Reduce Levo to compensate & monitor results to qet free t3 up.